Built in 1908, the Morrison has been the cornerstone of services to disabled homeless adults in Seattle for over three decades. Connections, a comprehensive daytime service and referral center that addresses the needs of homeless individuals by providing individualized support, basic skills training and referrals to local services and housing. The Morrison was initially renovated in 2005 and is now in need of some major system upgrades. 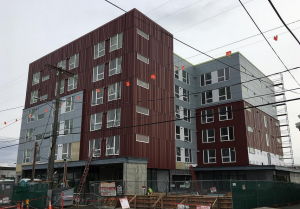 DESC plans to perform a limited rehabilitation of some of these systems using available funds including from the City of Seattle Housing Levy and the State of Washington Housing Trust Fund. We will be applying for funding in September 2017 and results should be available in December. If successful, construction will take place during 2018, and will primarily focus on upgrades to building systems. Have questions regarding the Morrison’s systems upgrades?